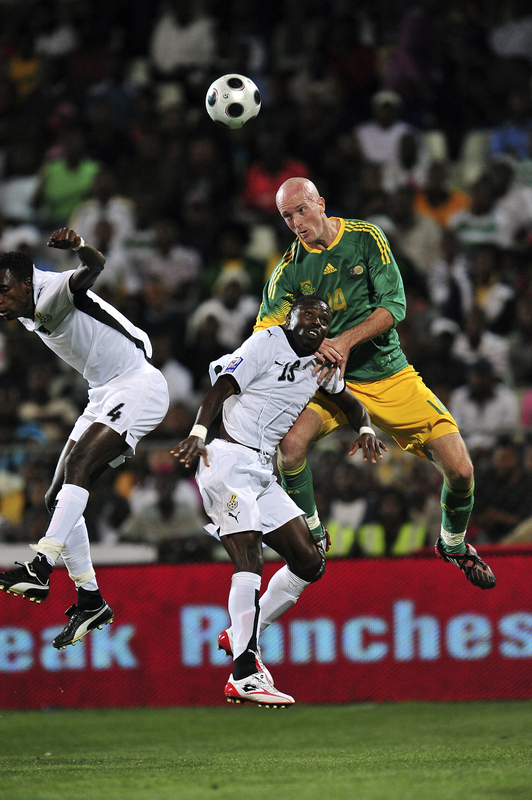 On 15 October 2008 I covered the Bafana Bafana vs Ghana soccer match at Vodacompark in Bloemfontein. Once again realising the big difference in photographing Rugby and Soccer. In Rugby one can, most of the time, get away with following the ball and not miss a lot of the game by doing so. In Soccer, one has to preditermine which player is going to receive the ball and focus on that player before the time, so you don’t miss too much of the action. For example, have a look at the photo below of Mathew Booth(Bafana player for those who don’t know). I saw one of the bafana players passing to the middle and while the ball was in the air I had to determine who was going to receive it. In this case it was Matthew and immediately focused on him. Luckily i got the shot. By the way it was a night game and I had to use a ISO of 4000 on my D3. The exposure settings were 1/800 of a sec. and F4.5. I used a 400mm F2.8 VR lens with a 1.4 converter attached to it. Then of cause in rugby, as well as soccer, there will always be some action after the action. So don’t look at that little screen at the back of your camera to early (Rememder you are there to take photos, not to look at your photos). The bottom line is; don’t take your eye away from that little hole because you might miss the shot of the day. This photo of Teko Modise was taken after he hit the crossbar in an attempt to score a goal,showing his frustation afterwards. Copyright remains the property of Superimage Media.